Oh, and Kevin Sorbo does some voice work. Pwnee Studios has created a co-op platformer that pits you against a never-ending level design AI. It sounds so chaotically painful it just might work! We're pretty sure you'll want to know about this game. Cloudberry Kingdom has a few bright colors in its palette, features characters that look fairly non-violent, maybe even a bit cute, and since its name sounds like a cotton candy flavor, we'll forgive you for thinking it's an innocent platform game about love and hearts or something. 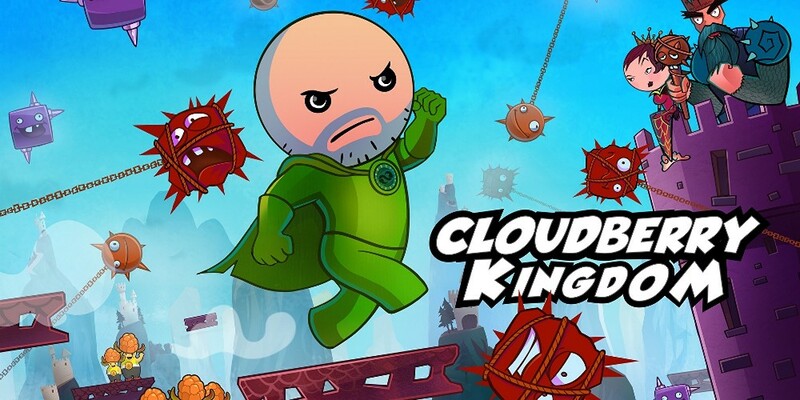 In reality, Cloudberry Kingdom is an old school platform game with the singular goal of delivering an intense, nail-biting experience. But don't really bite your nails, 'cause one slip-up and you'll probably die. Cloudberry Kingdom offers some really curious features for a platform game. For starters, you can design your own physics. Add a jetpack, adjust gravity, friction and plenty of other parameters, all to create a unique experience once you get out there and start running around. It can do this because the level design AI adjusts stage layouts to match your playing style. If you're good and keep doing that thing where you don't die, the AI ups the difficulty. If you keep failing the AI makes things easier, but nobody plays a game not to win, right? Oh, except that one Star Trek episode where Data played Strategema to achieve a draw. Co-op mode can only make things crazier. Up to four local people can play story mode, free play or infinite arcade together. There's also the co-op-only bungee mode which tethers everyone together and forces them to collaborate to clear a level. And yeah, there's Kevin Sorbo, too! TV's Hercules and Andromeda's Captain Dylan Hunt provides some voice work for Cloudberry Kingdom. That fact alone makes us insanely curious about this game. Cloudberry Kingdom is scheduled for release July 30 on PS3, July 31 on Steam and Xbox 360, August 1 on Wii U, and fall 2013 for PS Vita, Mac and Linux.